Police are searching for two men they say robbed a Mount Airy store at gunpoint and beat a witness on the ground. Philadelphia police are seeking the public's help identifying two men they say robbed Park’s Market East in Mount Airy at gunpoint on Wednesday and beat a witness on the ground. 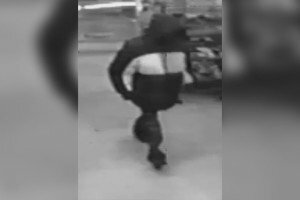 Police said that on Wednesday at about 6:43 p.m., two unknown African-American males wearing hooded jackets entered Park’s Market at 6520 Germantown Ave.
Once inside, police said both suspects, one of whom was wearing a mask, walked to the rear of the store as if to shop before one of them began assaulting a 63-year-old man who was standing near the store's entrance. That suspect is described by police as being in his early 20s and about 5 feet 6 inches tall with a thin build. Police said that as the first suspect fought with the victim on the ground, the second suspect, the man wearing the mask, pulled a handgun, went behind the counter and demanded money from a store employee. Officials described him as about 5 feet 8 inches tall with a medium build. After taking an unknown amount of money from the cash register, both suspects began kicking the 63-year-old man on the ground about his body and face before fleeing the market, officials said. Police said both suspects, dressed in dark clothing and jackets, then fled and were last seen heading south on Germantown Avenue. Anyone with information is urged to call Philadelphia police at (215) 686-8477 or text a tip to 773847.